Around five years ago, I decided to move to Berlin after visiting the city for a weekend and instantly loving it. A sense of freedom was palpable along its wide streets and in the parks where people sat drinking massive bottles of cheap, decent beer. Smoking was allowed in bars and clubs. Graffiti was everywhere. Parties went on all night. Compared to the London I had grown up in, a city changing dramatically and one I felt increasingly alienated from, Berlin was liberating. I lasted two months before returning home. My time there had turned into one long party, a transient existence – a stereotype. 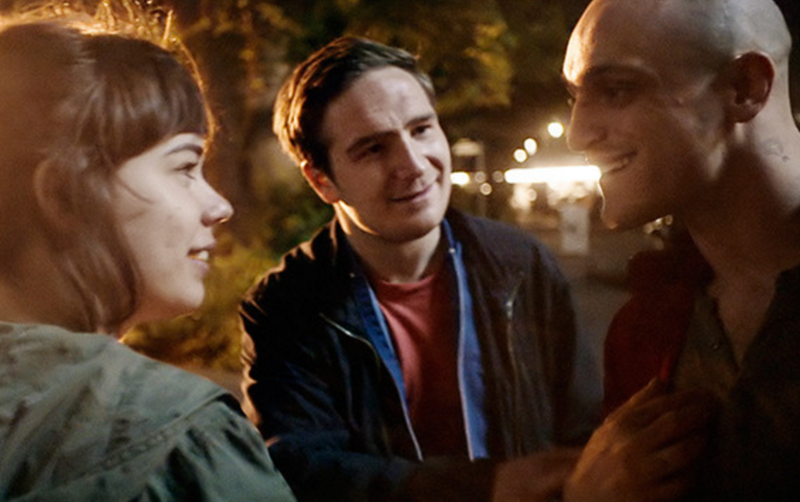 Watching Sebastian Schipper’s Victoria, a Berlin-set tale shot in one breathless, single take in and around the neighbourhoods of Kreuzberg and Mitte, I was inevitably reminded of my experience. The film encompasses many of the city’s contradictions and truths. It paints both a reverential and a pessimistic view of the city, lamenting a lack of opportunities while also celebrating it. Its titular character is a twenty-something woman from Madrid, new to Berlin, who speaks no German. She goes out dancing alone at a club and on leaving is accosted by a group of local men, all around her age, who have been refused entry. Victoria and Sonne, their de facto leader, start to flirt. They all leave together, steal booze from a shop and hang out on the roof of a nearby building, where the party continues. Much later, events take a sinister turn when the group carry out an armed bank robbery and Victoria is roped in as getaway driver. Victoria begins by painting a romantic and admiring portrait of the city. The sensuous opening scene is all pounding techno and pulsing strobes. The carefree way Victoria chats with bar staff and lets herself be approached by Sonne and his friends reminded me of the fearless, unselfconscious nature of the city. When she leaves the club with him and the others, I felt a twinge of anxiety. Perhaps projecting a cynical London-centric view, I worried that a group of drunken men, already irritated at being refused entry to a club, would take advantage of a beautiful Spanish newcomer who could be seen to embody their hometown’s gentrification. But these fears were unfounded. The crew seem genuinely happy to have met such a sunny person in Victoria and bring her along on their night out, sharing insider knowledge of every street corner, shortcut and secret staircase. But fun soon gives way to fear and violence as the film’s final act results in an armed robbery of such tension, it’s hard to even watch. Depressingly, it is Victoria’s carefree attitude and openness that leads her down this dangerous road. Her decision to drive the gang to meet a known gangster is questionable at best. Later, she doesn’t have a choice, but at that point, she does. And so, her impulsiveness and sense of adventure – archetypal Berliner attributes, in an outsider’s eyes – are used to caution us against this same attitude in the very home of the bold, alternative lifestyle. I was also drawn in by Berlin’s creative, non-conformist sensibility, which is reflected in Victoria’s one-take style: courageous, chaotic and inherently risky. Three versions of the film were shot over three nights, director Schipper using the third version for his final cut. He reportedly told his cast to embrace their fear of failing in what is arguably a cinematic experiment. One mistake and everything could have been ruined. At first, I saw Schipper’s method purely as a metaphor for the risk and thrill of relocating to a new place and the turning away from the apparent safety of a 9-5 routine. It was only after thinking again about Victoria that I realised this reading of the film was far too idealistic. My growing ambivalence towards London meant I was easily swayed into reading it as an affectionate portrayal, but it is far more than a love letter. For all that it revels in Berlin’s youthful exuberance and party culture, the film is also filled with crime, anger and the consequences of a lack of opportunities. On initial viewing, I near ignored the car thefts, shoplifting and the fact that one of the group, Boxer, has a violent streak. Instead, I delighted in its club scenes and moments of connection between Victoria and Sonne – the whole ‘Berlin-ness’ of it. With a story that celebrates hedonism, youth and Berlin itself while looking at grief, darkness and the city’s underworld, Victoria is certainly balanced in its depiction of the city. Given that it is directed by a resident German, though not a Berliner, and focuses on a Spaniard and her involvement with locals, it is replete with ex-pat and native experiences. What is notable is its focus on the lack, rather than wealth, of opportunities for young people. Sonne and his gang are so bored that they are involved in petty crime, which leads to serious crime. Victoria seems relatively content working for the minimum wage in a café, although her pay is scoffed at by Sonne, pointing to locals’ disparaging views of outsiders who choose to live in relative poverty. She is also a frustrated artist, a talented but ultimately failed pianist who, after much persuasion, plays a section of the first Mephisto Waltz to a clearly moved Sonne. Now, she just parties and works for a pittance. But, unlike much of the press focusing on Berlin’s gentrification and the discontent of natives, Victoria does not seem to be saying the city is going down the pan. On the contrary, the film shows it for the exciting, vigorous and vital place it still is. It rejoices in Berlin’s multiculturalism and freedom, but given that events unfold so tragically for Victoria it also seems to suggest that visitors should stay mindful of the complex realities underpinning their ex-pat dreams.